A team of Sydney scientists has made a ground-breaking discovery in telomere biology, with implications for conditions ranging from cancer to ageing and heart disease. The research project was led by Dr Tony Cesare, Head of the Genome Integrity Unit at Children’s Medical Research Institute (CMRI) at Westmead, in collaboration with scientists from CMRI as well as UNSW Sydney’s Katharina Gaus. The unique area detector technology of ZEISS LSM 880 with Airyscan made it possible to image telomere structures. Telomeres are DNA segments at the ends of every human chromosome. As we age, telomere length naturally decreases. Over the course of a lifetime, telomere shortening instructs ageing cells to stop dividing. This normally functions as a critical barrier to stop cancer. However, some people are born with abnormally short telomeres and suffer from bone marrow failure, pulmonary fibrosis and high rates of cancer. Telomere length is also an important marker of disease risk for conditions such as cancer, heart disease and diabetes. Telomere shortening causes chromosomes ends to resemble broken DNA. However, it has remained a mystery why telomeres change from healthy to unhealthy with age. This research has identified the underlying cause. Additionally, the team identified that telomeres can also change structure in response to some chemotherapeutic agents, which helps kill cancer cells. The results of this study have also proven how important technological advances are in the field of research. Dr Cesare first developed his theories about telomere-loops in 2002 when studying for his PhD. However, the technology was not available at the time to easily visualize telomere-loops using microscopy. However, the advent of superresolution microscopy, which was awarded the 2014 Nobel Prize in Chemistry, made it possible to see telomere-loops with a microscope. To complete this research, the team used superresolution microscopes at four Sydney research institutions, and purchased the first ZEISS LSM 880 with Airyscan in Australia. 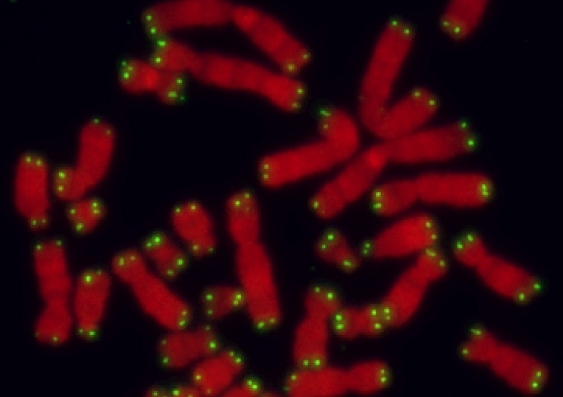 Mitotic chromosomes from the HT1080 6TG human fibrosarcoma cell line stained with propidium iodide to identify DNA content and telomere fluorescent in situ hybridization (green) to identify the repetitive telomere DNA sequence. To complete the project, the team combined this breakthrough technology with powerful genetic models that mimic cellular aging.